This Ministry of Manpower (MOM) accredited course is a mandatory training course for Occupational First Aider. It is aimed to train individuals to render first-aid treatment to the casualty during an emergency or accident in the workplace until more advanced medical assistance can be obtained. There are six essential skill sets required for the OFAC in order to apply first aid at the workplace. The focus is to correctly identify the patient’s condition and apply first aid immediately to save life or stabilise the situation. These skills must be demonstrated and practiced during the course. At the end of the training, participants will be competent in the following skills:. Any individual with an interest in first aid or has been assigned a WSH-related role in the company. Must be physically fit and able to render help to another individual during an emergency. ESS Workplace literacy and numeracy Level 5 or above (GCE N/O Level pass or equivalent). Learner of this course are advised to have at least ES WPLN Level 5 & above or equivalent as otherwise, the learners may find the course challenging to understand and pass the required assessments. Candidates will be assessed through a written test and practical performance on bandaging (covering at least 3 mains areas of body: head, trunk and limbs, to integrate with case scenarios), CPR + AED. 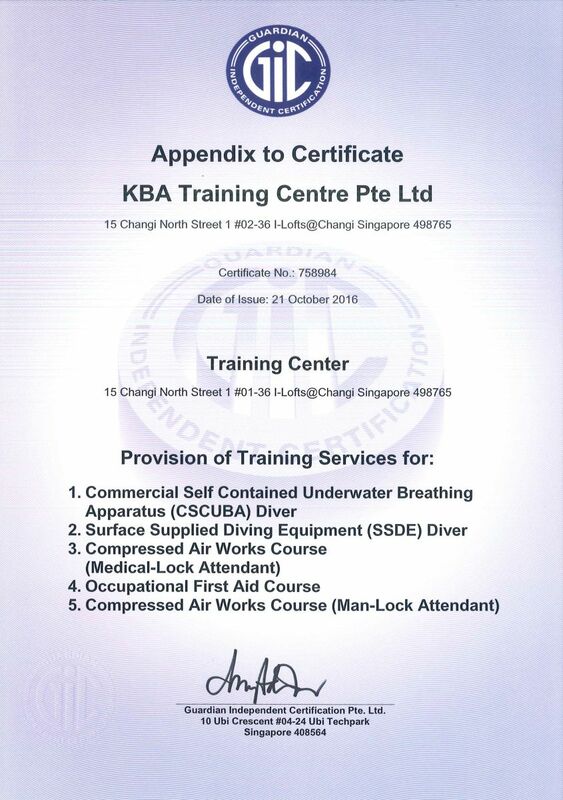 Upon successful completion, candidates will be awarded a certificate from KBA Training Centre Pte Ltd ~ accredited under ISO 29990:2010 Standard, which is valid for 2 years; CPR+AED certificate is accredited by Singapore Resuscitation and First Aid Council (SRFAC) - valid for 2 years. 1. Approved for Skills Development Fund (SDF) Training Grant - Up to 95% subsidy (eligibility criteria apply). Absentee Payroll (AP) approved. Upon successful completion of training, WSH Officer can apply for 22 SDU points as part of their Continuing Professional Development (CPD) programme. It's easy to understand and remember, trainer Pebbles has done good. I enjoyed most about being presented by broad information about first aid. The trainer was very interactive and have given lots of examples and scenario. I enjoy the videos and practical session as I am a hands-on person. I enjoy the spontaneous approach to teaching. The interaction between the trainer and the student is good, there's a lot of communication. The energy level of the trainer is high and delivered the information very well. Definitely learned a lot of new life-saving skills, classes are interactive and Ms Pebbles (the trainer) made it fun but also very professional. Training was well conducted and adequate. OFAC is a great course, learned a lot from it. Enjoyed the practical and interaction. The revision is very informative too. I learn more about the body function in this course. Very useful and can help save life, learn a lot during hands on. The training is good. I enjoyed making new friends and knowing a good instructor. Manage to learn various methods on how to do first aid bandaging. Pebbles (the trainer) is awesome! Enjoyed Pebbles' interactivity with the class. Felt that she really opened up to us, it's enjoyable being on the receiving end of an enthusiastic trainer who knows their stuff. Pebbles is very knowledgeable & engaging as a trainer. Practical session was very relevant too. It's very informative and engaging. I like the presentation of the subject matter and bandages. Instructor explained and done professionally. I basically know how to save a person in an emergency situation, I've gained knowledge and new friends. Ms Pebbles is awesome and so cute. Anyway, the course is very helpful and she managed to explain it very clearly. Learning how to use CPR method and AED is interesting! The trainer’s knowledge and interaction was very good. The practical tests are the most enjoyable part. The course is very informative, trainer is effective, knowledgeable and energetic! I enjoyed the practical CPR & AED, it’s my first time attending and gain a lot of knowledge. Excellent allocation of time and arrangements to course notes. Friendly and experienced trainer who speaks eloquently and makes sure the courses are well understood and all queries are answered. Thoughtful application of powerpoint slides as well as usage of videos.